Welcome to Joe's Custom Creations! This is a unique store that offers many great hard to find or out of production factory LEGO® STAR WARS minifigures, sets, and accessories! Joe's Store specializes in custom LEGO brick creations such as the set in this listing as well as custom aftermarket accessories and hand detailed minifigures. Please note that Joe's Custom Creations is a custom plastic building brick, set, and minifigure shop that is not affiliated with the LEGO group. After viewing this listing come and check out the store, new items are added on a regular basis! This listing is for one of Joes deluxe customized versions of the model 7662 MTT. A Custom Clone Wars Version! Features 20 Battledroids and 1 Destroyer Droid for a total of 21 figures including 2 Driver Droids and a Commander! Role out the droids just like in the movies and prepare to battle the clones! Includes a STAP Single Trooper Aerial Platform for forward reconnaissance. Over 1200 LEGO bricks & parts! Made from 100% NEW - never used - factory LEGO bricks. Includes building instructions on CD-R set ships unassembled in sealed polybags. Picture is of display model your set will only use new bricks never before used or built with! All bricks are original LEGO brick colors that have be painstakingly collected for years and sorted for this set. Once gone these special sets may never see Joe's shop again! So don't wait too long if really interested. Includes Instructions for building this fantastic set, piece by piece! See more details on instructions below. INCLUDES all pieces and figures shown in pictures. This one of a kind masterpiece was created using 100% LEGO Bricks, painstakingly collected. The model is 95% faithful to the original 7662 Trade Federation MTT design. Many steps were changed to allow for the special design of this MTT model, the other vehicles like the STAP, and various color changes. Every change is clearly illustrated in the custom instructions on CD-R provided with this set. At times a used part (1%) may slip by in the sorting process but will likely be in excellent condition! A customized step by step set of jpg. Picture instructions on CD-R created from scratch will be used to painstakingly take you through the creation process! A laptop is best for these types of instructions as it is portable and can be placed wherever the engineer will be working on this great set. The instructions will detail every piece, color change, and customization STEP by STEP and will allow you to create this Masterpiece as well! Additional customizations will be clearly explained as well. Continue the Star Wars saga, Crush the Republic! With this MTT no enemy clone force on the ground stands a chance! ALL BUYERS MUST PAY USING. · We do not mark merchandise values below value or mark items as "gifts" - US and International government regulations prohibit such actions. 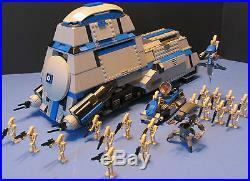 The item "LEGO Brick STAR WARS Custom CLONE WARS 7662 MTT Gray & Blue + 20 BATTLEDROIDS" is in sale since Sunday, August 18, 2013. This item is in the category "Toys & Hobbies\Building Toys\LEGO Building Toys\LEGO Complete Sets & Packs". The seller is "jaf1970" and is located in Conesus, New York. This item can be shipped worldwide.